New Star Wars comic reveals the origins of Anakin Skywalker's mask. Darth Vader's helmet is among the most recognisable iconography in cinematic history, and intrinsically linked to the Dark Side of the Force. 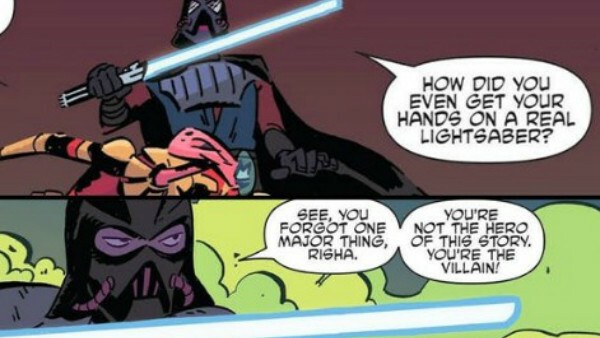 And while we've already seen him becoming the man in the mask, a new Star Wars comic reveals that Anakin Skywalker had his hands on it long before he became a Sith Lord. 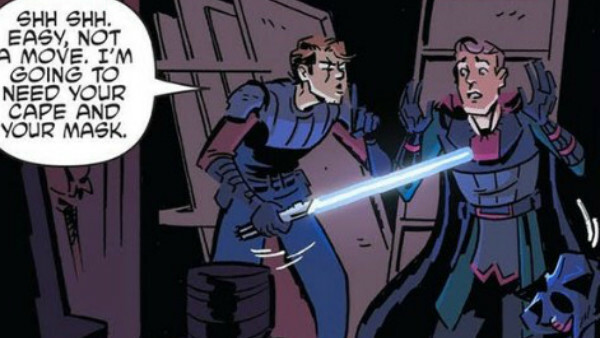 Star Wars Adventures #13 takes place during the Clone Wars, and follows Anakin and Padmé on a covert mission. The plan is for Padmé to attend performances by famous actress Risha Synata who, it turns out, is secretly working for the Separatists and sends droids to kill the pair (although that attempt is obviously unsuccessful). Later, Anakin and Padmé find a message from none other than Count Dooku, who has instructed Risha and her acting partner to wear gas masks, with a deadly gas set to leak into the theatre and kill the Republic-supporting audience. The duo set out to stop the plan for going ahead, with Padmé evacuating the theatre, while Anakin takes the place of the leading man. To do so, however, means he has to take on the role of a lightsaber-wielding villain, for which the costume includes a very familiar looking mask. Putting on the familiar garb, which also includes a cape and breathing apparatus, Anakin is able to save the day. There's no further information given as to where the mask comes from, or what it means for the one Vader himself would eventually wear. In The Clone Wars, Yoda has a vision of Darth Bane who wears a similar kind of mask, and Revan also donned one similar to that Kylo Ren would later wear, so we know that this kind of style is part of the traditional Sith armour. It could even be that this exact style of helmet was produced by the Confederacy, hence why Vader's design is the exact same, or it could just be a fun little nod to who Anakin will become. This is just one of many additions made to Darth Vader canon by the Star Wars comics recently, which have ranged from a battle with Han to see who the best pilot is in the galaxy, revealing why he obeys Tarkin, and his potential role in destroying the Death Star.